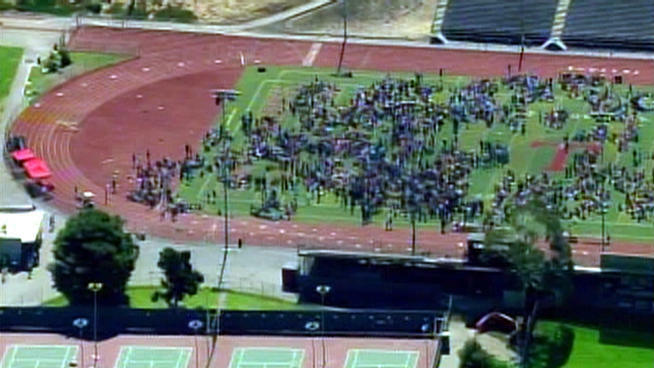 School Locked Down After Bomb Threat | NBC San Diego – San Clemente High School is on lockdown after an AWOL Navy Corpsman from Camp Pendleton left a note saying he had planted a bomb. Police are looking for Navy Corpsman Daniel Morgan, 22. Morgan was last seen in his Jeep. Shortly before 9 a.m. on Wednesday, base officials noticed a Marine was missing from the base. After a search of the Marine’s barracks, they found a note saying he had planted an incendiary device on the school grounds. The students have been evacuated to the school’s stadium. This message is to inform you that Orange County sheriffs’ officers are investigating a bomb threat at San Clemente High School. At the direction of sheriffs’ officers, the entire SCHS staff and student body were evacuated to the stadium after it was inspected and declared safe. Parents and other community members are asked to not go to the school at this time. Security personnel and officers are guarding the stadium and prohibiting entry onto the campus. More information will be made available on the school website and through this communication method. Additionally, you may call the District rumor control hotline at 949-234-5575 for additional information. My first real exposure to the military was the movies. If there’s one thing I learned from “The Rock”… it’s don’t eff with Marines…or any branch of the military. These dudes are just too badass. And if something goes wrong along the way, you know, mentally or psychologically… and that badass gene turns into a crazy badass gene. Well, then you’ve got a big problem. Remember the shower room scene when the Marines had the elevated position and they wiped out an entire team of Navy SEALS? Yeah. No thanks. Now there’s this dude. Going AWOL on the rest of the unit wasn’t bad enough for this guy though…so he PLANTED A BOMB IN A HIGH SCHOOL?! What the hell, man? I don’t care what the Navy has done to you…or what anybody in this high school has done to you. This is not how a man handles his business. Mount up, Lobsters… Mission: Find Daniel Morgan is on. Btw, is moving all the kids into a field together in one spot really the best idea? What if this guy didn’t plant a bomb… and he’s watching the news…or reading LobShots… and sees where all these kids are, so he takes the bomb to them? What about that? Am I the only one that thinks like that? Let these kids go home…STAT. Great first day of school, huh? This entry was posted in News and tagged AWOL, AWOL Navy, Camp Pendleton, Daniel Morgan, high school bomb, Marines, Navy, Navy Corpsman, San Clemente High School. Bookmark the permalink.